The website of Healthy Lanka. Healthy Lanka Alliance for Development (HLAD) has been presented with the award "The Best Preventive education institute" in a ceremony in Colombo, Sri Lanka. HLAD is running a large alcohol and drug prevention programme in local communities in many parts of Sri Lanka. 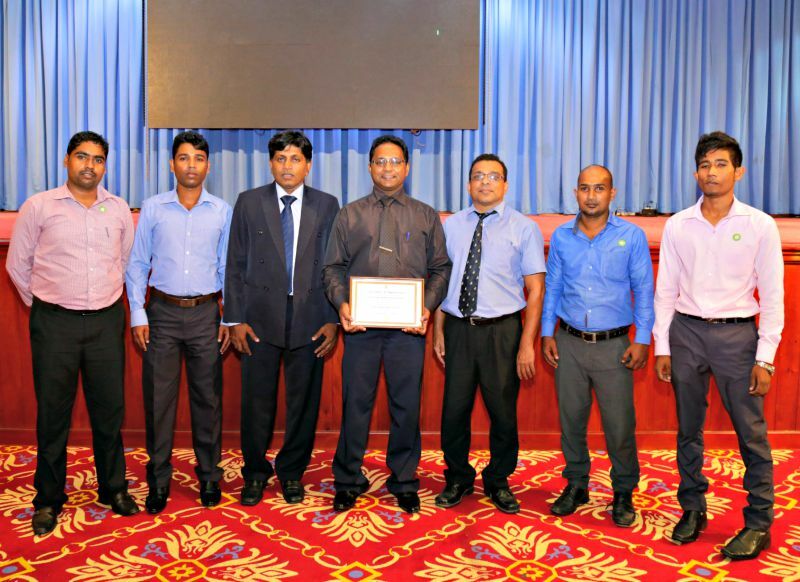 A prize to the best prevention education institute is awarded every year by the Sri Lanka National Dangerous Drug Control Board (NDDCB) in collaboration with the Ministry of Public Order and Christian Religious Affairs. 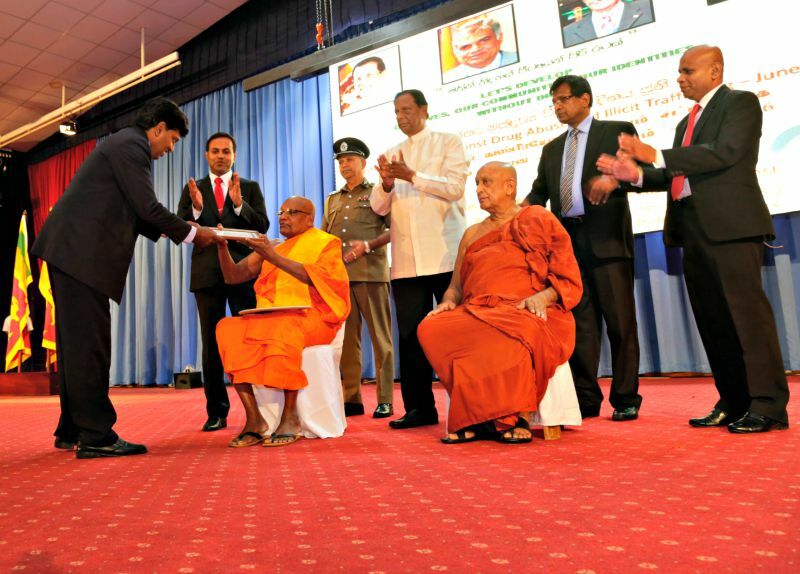 The prize for 2014-2015 was presented to the national NGO Healthy Lanka Alliance for Development recently in a ceremony held at Temple Trees, the presidential palace in Sri Lanka. - We extend our congratulations to Healthy Lanka Alliance for Development, both to its leadership and to the many dedicated local activists, comments Morten Lønstad, Secretary General of FORUT. HLAD is one of FORUT’s five partner organisations in Sri Lanka. - This is a fantastic achievement for a young organization like HLAD and a result of hard work from a dedicated and competent staff. The ceremony in Colombo was attended by the Prime Minister as chief guest, the Minister of Public Order and Christian Religious Affairs, the chair of NDDCB and other officials from relevant government departments, police and forces. Furthermore, an audience of around 6000 participated at this occasion from civil society organizations and community workers on alcohol and drug prevention from the entire country. Many of these were local project workers who do the practical outreach work for HLAD in the communities. Healthy Lanka Alliance for Development is a local organization in the process of registration as an NGO. Healthy Lanka is guided by scientific, evidence based knowledge and is expected to facilitate community change towards a healthy lifestyle. The organization’s main focus is on the prevention of alcohol, tobacco and other drugs through a health and wellbeing promotion approach. Healthy Lanka endeavors to create an environment that allows the fulfillment of the rights of every individual, family, and society, the main crosscutting theme on which the organization functions. The national policy programmes and events are designed and implemented with the purpose of strengthening the NATA Act. They shall ensure thatexisting laws are properly enforced, and new laws are formulated and added based on the necessity in the country. Advocacy activities and lobbying are a major component of HLAD's programmes. The organization is also developing a national level framework for the prevention of substance use by networking with other community and national level organizations working on similar projects in national level. Local level activities and events are designed and implemented with the participation of Civil Society Organizations (Healthy Lanka CSOs). The strengthening and mobilizing of the civil society is treated with utmost importance in achieving social change goals. Civil Society Organizations (Healthy Lanka CSOs) are represented by the members of the Community activity participating in community level social change. Healthy Lanka is operating in 12 divisional secretariat areas in five districts with their local prevention programme. Their national alcohol policy programme encompasses 80 divisional secretariats in 8 districts. The aim of all programmes is to reduce the impact of alcohol and drugs use to create a peaceful, happy, and healthy environment within the community. ADIC: Sri Lankan "NGO of the Year"